An old Cherokee chief told his grandson: "There is a great fight going on inside of all of us. 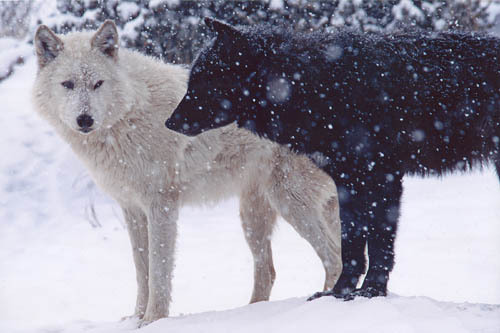 It is a fight between two wolves. One is evil: it is anger, jealousy, greed, resentment, inferiority, lies, and ego. The other is good: it is joy, peace, love, hope, humility, kindness, empathy, and truth." The boy thought about it and he asked his grandfather, "which wolf will win?" The old man quietly replied, "the one you feed." I remember reading that somewhere a long time ago, but for some reason today, it popped into my mind. This is probably one of the realest messages I've ever come across. We all experience highs and lows in life; this is inevitable. I think that at times, I've looked at other people and wondered why things seem to go so much easier for them. But honestly, no matter how great someone's life may seem from the outside, everyone is facing some kind of battle. Everyone is going through something. I believe that what makes the difference is how you choose to approach each situation. If anytime something goes wrong, you dwell on it, and you think about it over and over again ... eventually, that thing will consume you. It's so easy to get lost in all of the negativity, and to self-loathe or feel sorry for yourself. But when you do that, you are feeding the bad wolf. You are feeding the negativity and revolving your life around something that won't bring you happiness or joy. So what's the point? Replaying terrible situations and awful mistakes in your mind won't make them any better. It won't make them go away. You can only fight evil with good. We need to focus on the blessings that we have and channel our energy towards the positive. Be grateful, be honest, be kind. There's a saying that goes "when you've had a bad day, try and treat the world better than it treated you." That's really all you can do. Life is full of choices and opportunities. Now is your chance to feed the good wolf! i'd never heard this before but this is beautiful.